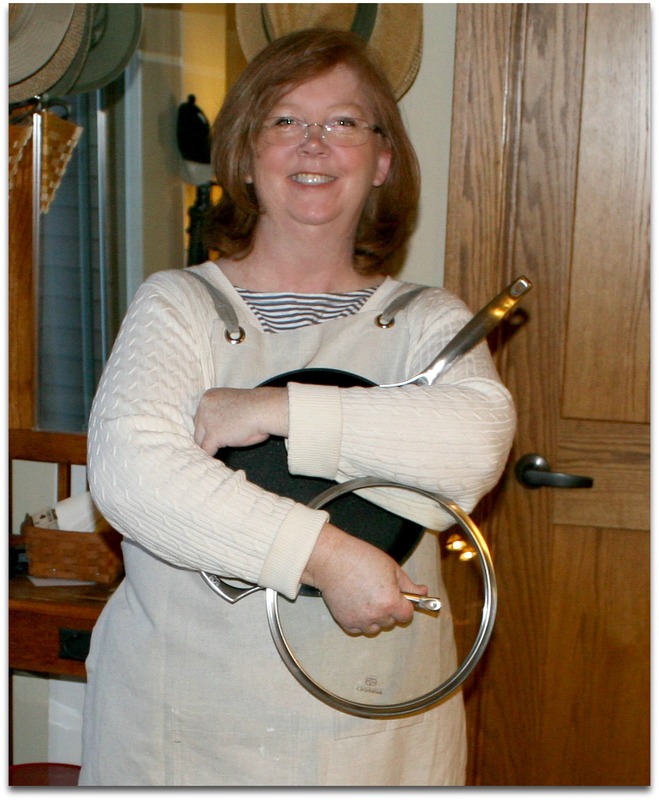 A few weeks ago, I was notified that my entry in a Calphalon online contest was the Winner! The hodge-podge of skillets and sauce-pans I use now is embarrassing. 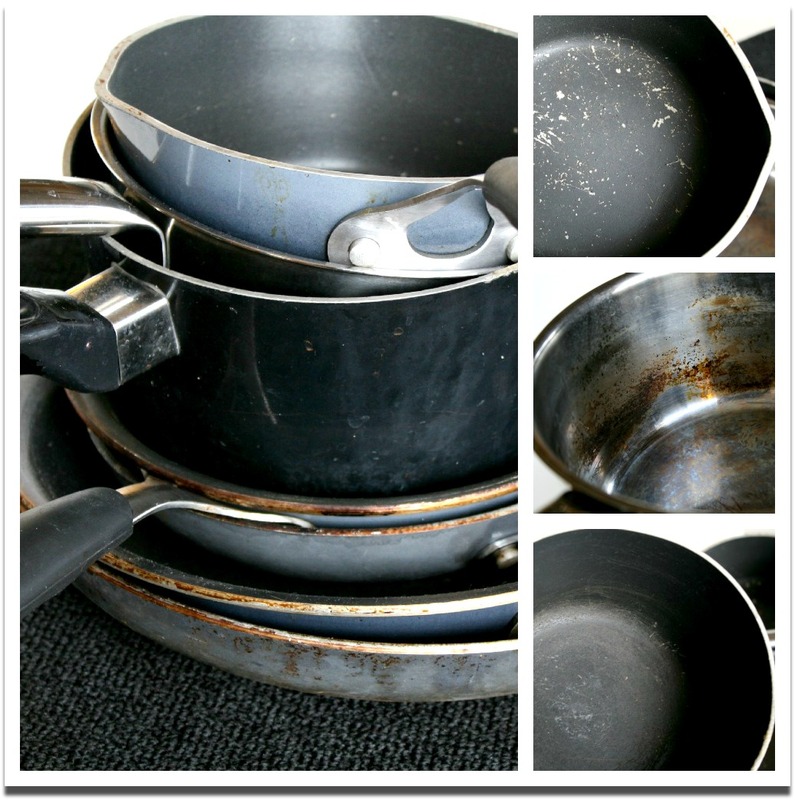 Cooking in dented, scratched and worn pans is not inspiring, not to mention un-safe. The contest was to choose a set of pans using their fun app on the Calphalon website and write a story about how you would use them. I told of how we live at TheHouseAtTheLake, quiet cooking during the week, like this Tomato Soup, but NoHoldsBarred cooking on the weekends for hungry hoards that come to visit! We cook almost ALL our meals at home, so the cookware would get a work-out. I chose some Small Pans and a few Large pans. I had so much FUN working on that entry! The boxes happened to arrive on my Birthday, so that made it even Better! 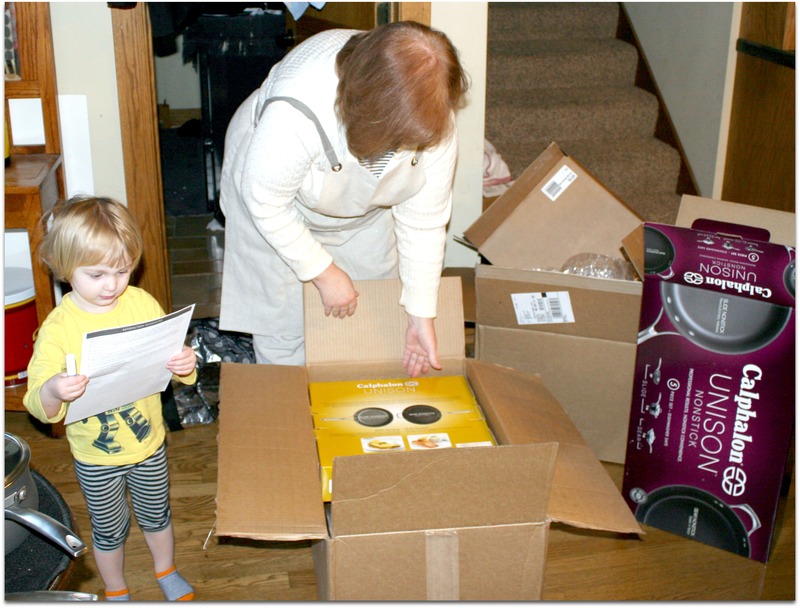 Alice took photos and checked the shipment invoices while I just kept opening boxes. 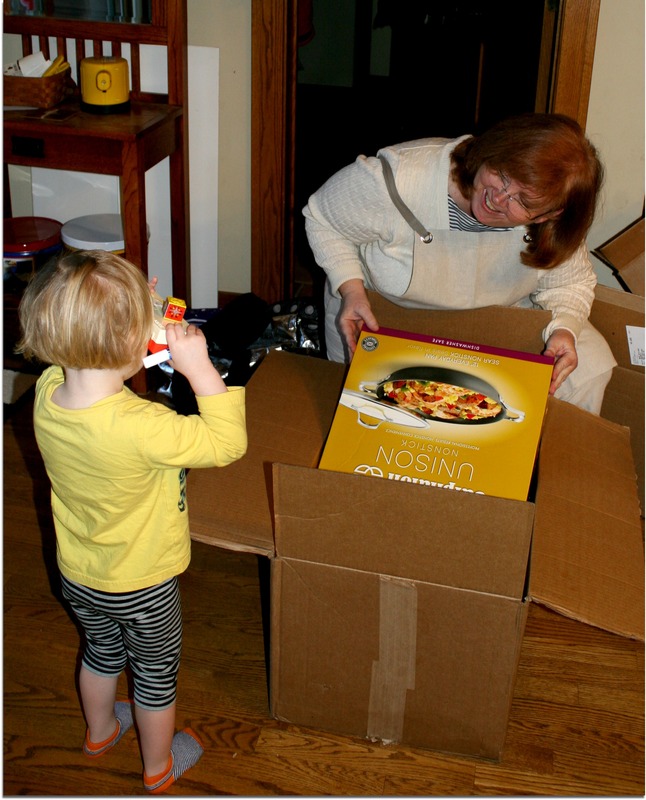 The winner received $500 in Calphalon pans. I got to pick out what I wanted. 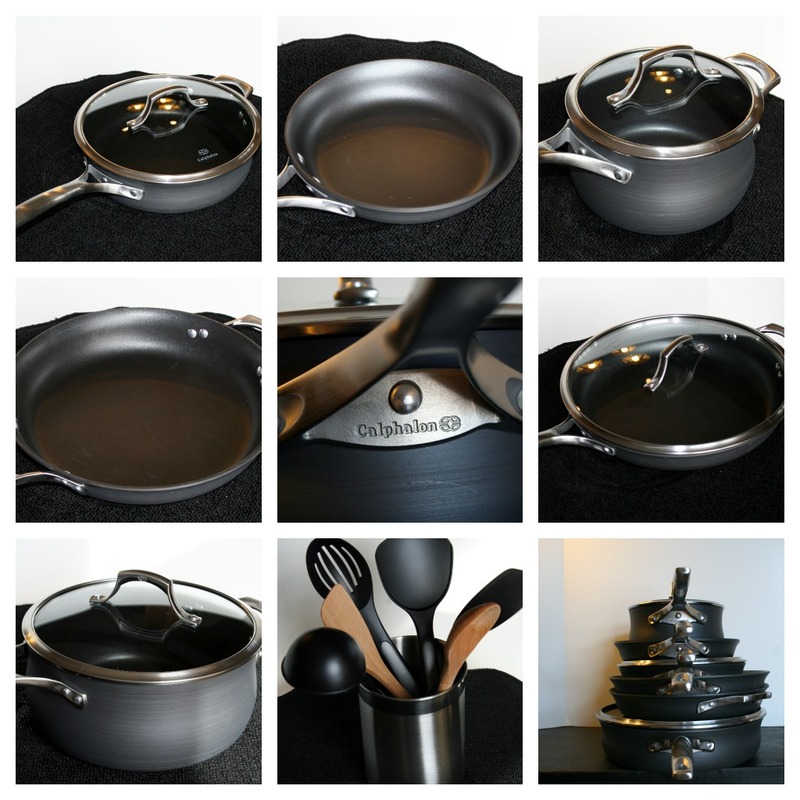 You see, in the Calphalon Online Store, you can customize your set for your life! 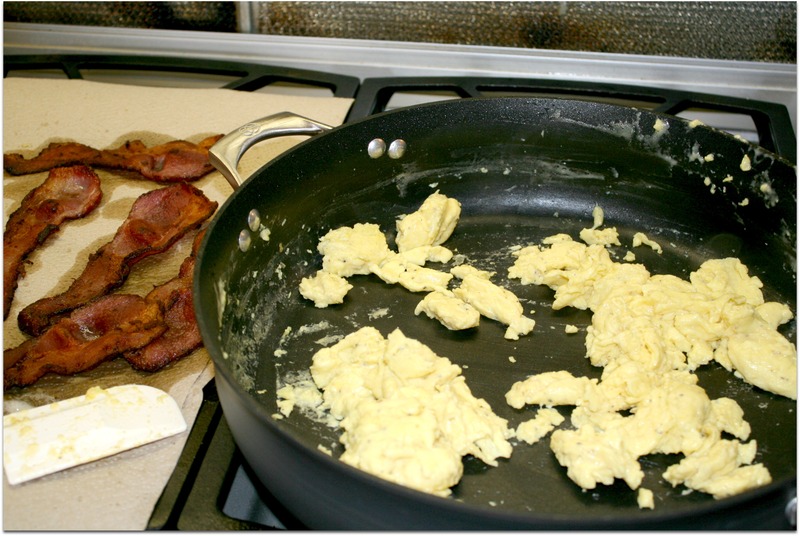 MY set has a few small pans and a few large ones….in the Unison Nonstick line. I’ve cooked several things already and I can’t say this enough. When you have the right tools, you can do the job. It washes as well as you think it would! I kinda sorta burned this dish…..some leftover noodles with cheese…..and it just slid out of the pan. THANK YOU so much, Calphalon, for your generous prize. I am beyond happy! When MY children were little, I didn’t have very much extra money for fancy schmancy toys….so they played mostly with traditional and homemade toys. IF I had a pile of money to spend at ToysRUs…….I wouldn’t have! The toys I chose for them to play were to spur skill, use their imagination, and to last for years. Now that I’m a Grandmother….the plan remains the same! Simple and Creative toys that will last years and years. I recently entered and won a contest sponsored by PurePlayKids and my order arrived JUST in time for Alice’s upcoming birthday. The toys are MADE IN AMERICA. They don’t smell weird or have shiny paint or have sharp edges. The box arrived real quick with a hand written note inside from the owners Mike and Tania. There was a time YEARS ago when Dan and I talked about opening a store like this. We didn’t, but we were frustrated at finding good, traditional, well-made, creative toys for our children. I’m so glad I entered this contest and FOUND Pure Play Kids.com. And I can’t wait for Alice’s birthday! Recently I blogged about making stock in my crockpot. I didn’t like the outcome as much as making it on the stovetop, but it turned out fine enough! The REASON I made the stock in my crockpot was to enter a contest hosted by Big Girls Small Kitchen. Well, I won a prize and it came today! Now I’m a HUGE fan of OXO and I’d like to think I have all their stuff, but I only had ONE of these items. The Tongs. Everything else was new to me. All for making some Chicken Stock……that I eventually made into Chicken Soup! 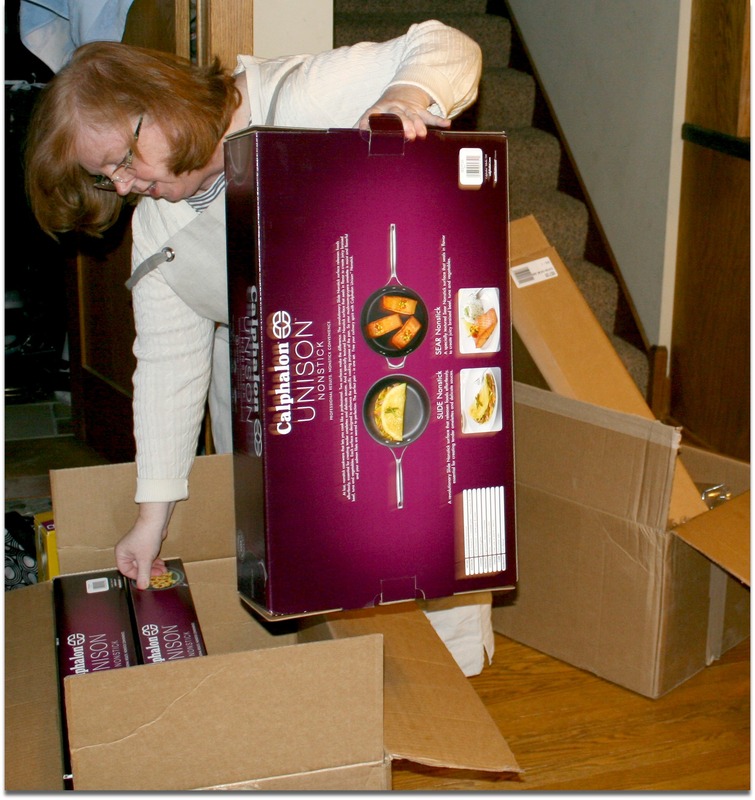 Thank you so much, OXO, for supporting Home Cooks with your Outstanding products. Thank you, Big Girls Small Kitchen, for hosting such fun contests! Now go find a contest and Enter! I know the recipe by heart and I change it almost every time I make it. I don’t know when I started making it, but the maker is always me. And when I make it…I change it…improve it….update it….but never stray from the star ingredient….the Colorado Peach. My father-in-law starts talking about it around the 4th of July. He gets his own pie. Every season. He expects it. It is always time for pie. But MY pie only happens when those peaches are perfectly ready. This pie, MY pie, uses Colorado Peaches and ONLY Colorado Peaches. No other peach will do. It is a perfectly persnickety peach pie. It can only be made for a few weeks at the end of summer. It doesn’t keep. It is best to share the pie with friends because the whole pie has to be eaten…or it gets soggy, mushy and icky. No leftovers. No saving. No eating later. Since it is labor intensive to make and then quickly eaten, some may think it not worth the effort. But this Pie of Mine made with Colorado Peaches, sugar, peach essence and love, is worth it. Life…like Pie…timed at the peak of ripeness and readiness, mixed with quality ingredients and love, yields success every time. Wash and Peel 4-6 Colorado Peaches, reserving the peels. Put about a cup of peels in a small saucepan with 1 cup of water, and boil until the water becomes essence of peach peels. Remove peels and cool. Cut up and crush the peaches and place in a large saucepan. I crush the peaches with both of my hands, squishing them between my fingers. Peel and Crush 4-6 Colorado Peaches. Add Sugar, Peach Peel Essence or Water and Cornstarch in saucepan and bring to a boil. Stir and cook until thick. Stir in 1 T. Butter. Set aside to cool a bit. Blind bake a pie shell and let cool. I use a Pillsbury Pie Crust in the red box from the dairy case. The story is about the peaches, not the crust. Peel and Slice 4 or more peaches to fill your pie shell. 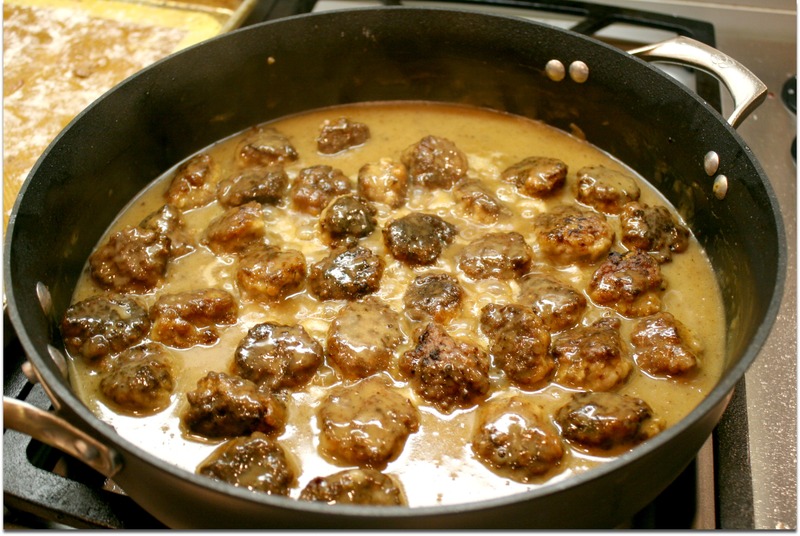 Then cover with the almost cool Peach Sauce and let cool in the refrigerator until it is firmed up. Sit down. Take a bit and eat with pleasure. So there it is in a PieShell. Choose your ingredients wisely and in their own season. Tinker with the recipe, adding and changing as needed. Don’t save for a better time. Enjoy now!